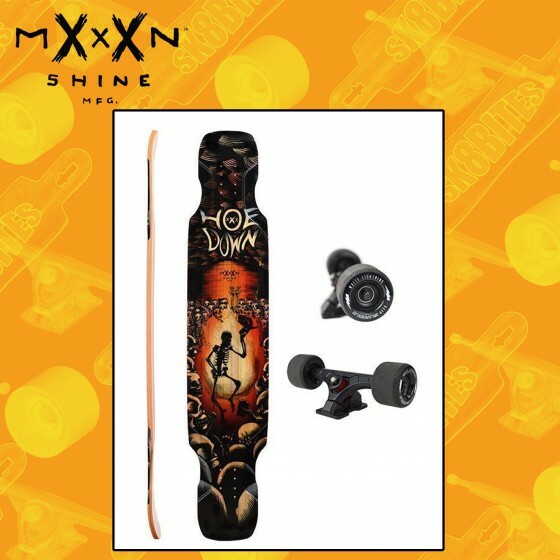 Wheelbase Options: 32" / 33"
The Hoedown is Moonshine’s dedicated dancing board, designed and shaped for ultimate stability and cruise control. In addition to our bomber two-ply vertically laminated core, the Hoedown is inlayed with two fiberglass stringers lengthwise along its midsection to give the board consistent flex, torsional stability and strength under foot - important factors for a board of its length – without the extra bulk and weight that many dancing boards suffer from. Simply put, for a board of its size (measuring 48” x 9.5”), the Hoedown is thinner, lighter and stronger than any other board on the market.